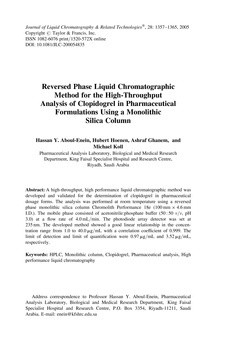 A high-throughput, high performance liquid chromatographic method was developed and validated for the determination of clopidogrel in pharmaceutical dosage forms. The analysis was performed at room temperature using a reversed phase monolithic silica column Chromolith Performance 18e (100 mmtimes4.6 mm I.D.). The mobile phase consisted of acetonitrile:phosphate buffer (50:50 v/v, pH 3.0) at a flow rate of 4.0 mL/min. The photodiode array detector was set at 235 nm. The developed method showed a good linear relationship in the concentration range from 1.0 to 40.0 µg/mL with a correlation coefficient of 0.999. The limit of detection and limit of quantification were 0.97 µg/mL and 3.52 µg/mL, respectively.